International Martial Arts Association Man and Woman of the Year 2004, Instructors of the Year 2009. 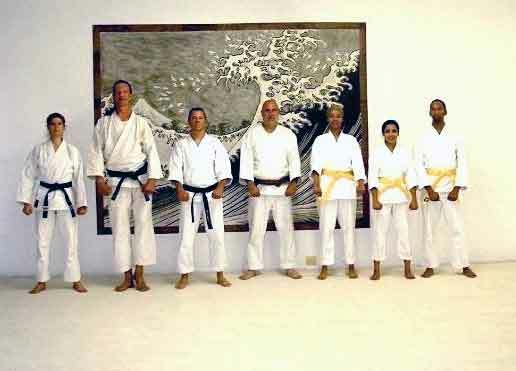 Member of the United States Ju-Jitsu and Shotokan Karate Associations. 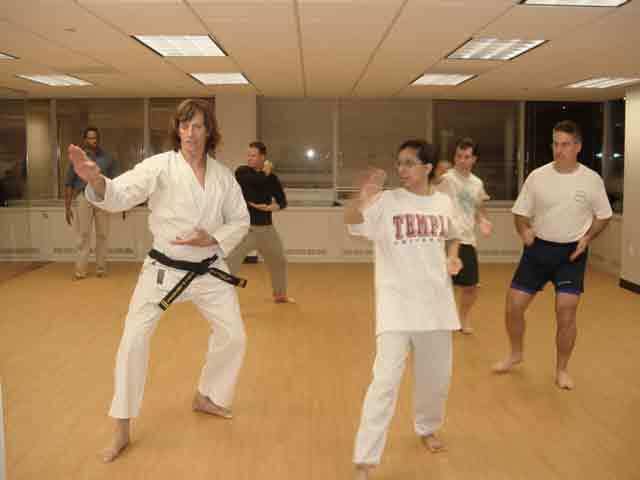 Training in Shotokan, Shorinji-Ryu, Goju-Ryu Karate, Tang Soo Do, and Ju-Jitsu. 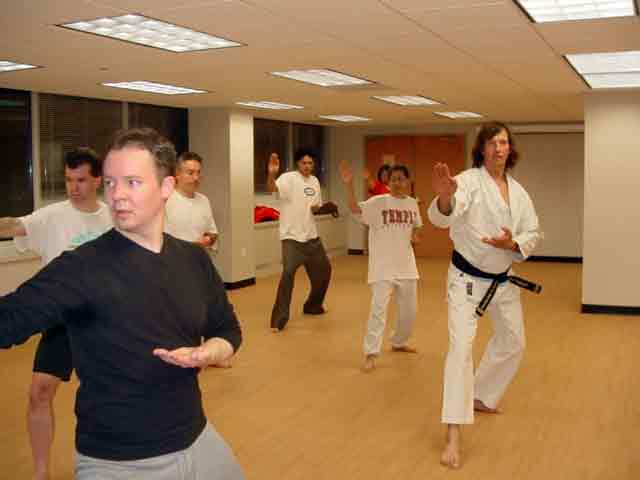 For adults who want to get back to martial arts or start for the first time. 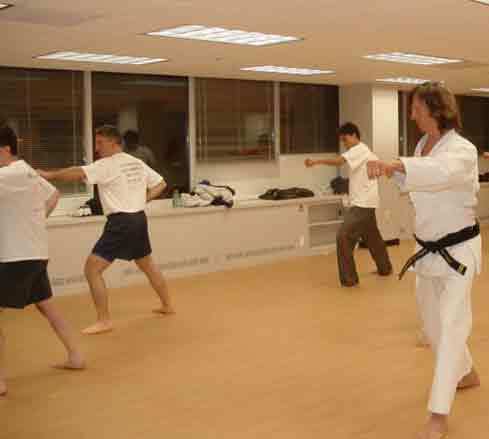 Classes are traditional, train physical skills in disciplined ways to get you back in shape, body and mind. Small classes, personal attention. Those already holding rank may attend wearing their rank belt. They are expected to meet requirements of the rank, or work back toward them. Tournament opportunities available, not required. 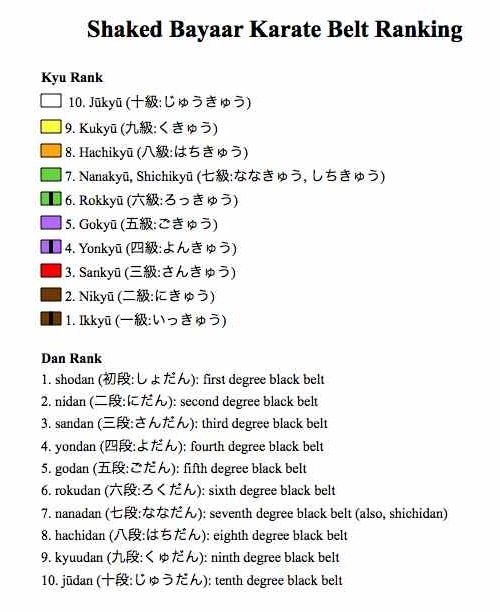 Students who want to advance belt rank may work up through Black Belt, based on merit and work. By advance appointment, Wonderful for family members while you take class. Done fully clothed, bare feet, lying comfortably on a soft mat. Other appointment times possible, including house calls to your center city location. More about Thai massage on Dr. Bookspan's web site here. Do gi (clean karate uniform) and belt. New students may wear white t-shirt and athletic pants. Never forget: karate begins with rei and ends with rei. Rei means courtesy or respect, and is represented in karate by bowing. shichi ten battou" also pronounced as "nana kolobi ya oki"
Never forget: karate begins with rei and ends with rei. 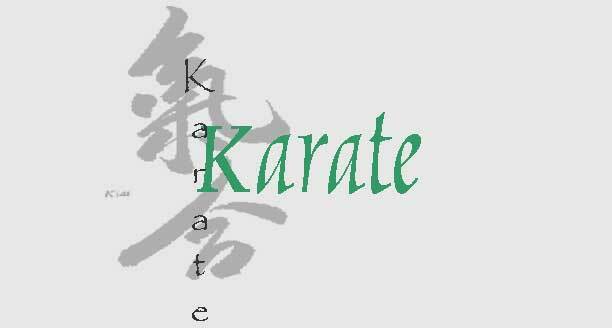 Rei means courtesy or respect, and is represented in karate by students respecting the dojo. These kun are the guide, philosophy, mind set to your training. Each rule is numbered "1" because each has equal merit. The Dojo kun are not to force morality, but remind of universal positives. Instead of mindlessly repeating as a chant, you remind yourself of using training for good, not excuses. 1) Seek Perfection of Character (work to be good) - Jinkaku kansei ni tsutomuru koto. 1) Defend the Path of Truth (be sincere) - Makoto no michi o mamoru koto. 1) Foster Spirit of Effort (put maximum effort into everything you do) - Doryoku no seishin o yashinau koto. 1) Honor the Principles of Etiquette (respect others) - Reigi o omonzuru koto. 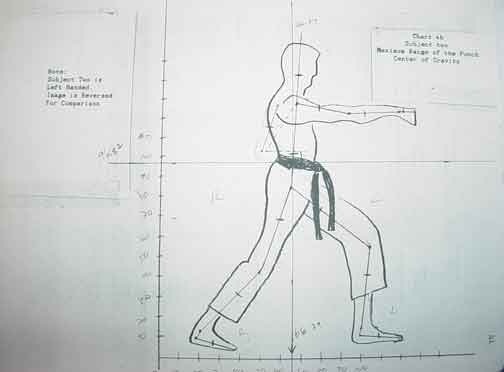 Healthy Martial Arts by Dr. Jolie Bookspan. Click BOOKS page to order on-line, or request in class at discount to our students. 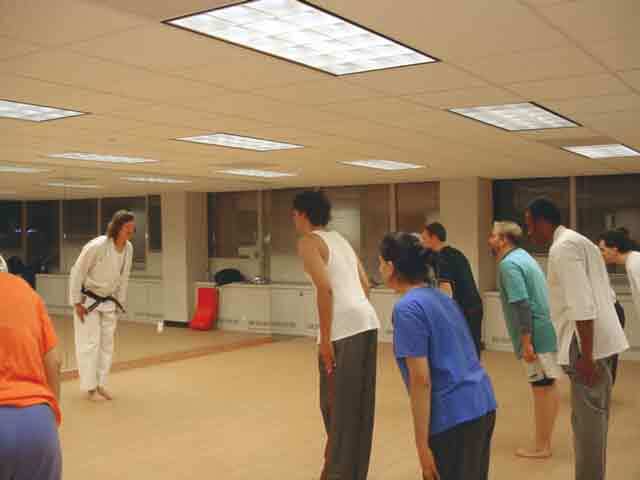 We teach healthy stretches that directly train martial arts positioning, balance and range, plus direclty train everyday healthy body position, range, and balance at the same time. Our stretches are "functional" which means how you move in real life. They are done standing. Just as not all foods are necessary or healthy, neither are several common stretches. We change that. For more about this exciting better way of stretching, and to learn one set of quick simple stretches that we use, click the Stretching Smarter article on Dr. Bookspan's web site (DrBookspan.com). 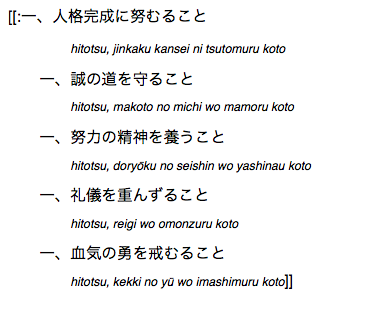 There are Mudansha or kyu kata, and Yudansha or Dan (black belt) kata. We start with Mudansha. 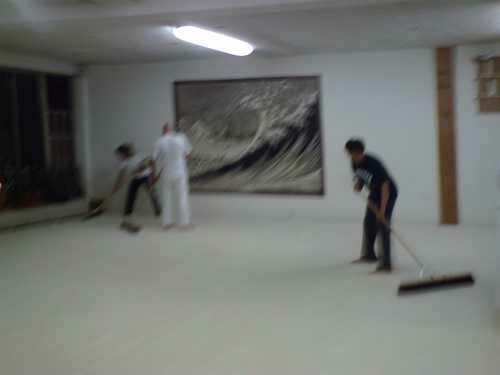 In Shotokan Karate, after the first five Heian katas, come the Tekki katas. Done completely differently in Shorin Ryu, Kenpo, Shotokan, Shito Ryu. Teaches not to argue which is "right." Readings below are from Dr. Bookspan's column The Fitness Fixer which ran on Healthline.com from 2006 to 2010. When they ended the column they removed all movies, comments, and most accompanying illustrations and photos. Come to class for the stories. 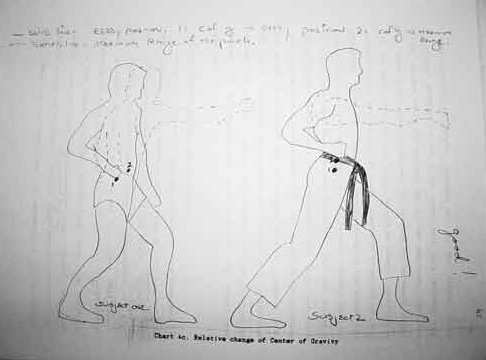 The first account of the computer simulation, with the story of Paul Sensei being high-speed filmed for a karate study, is below. We are working on putting all of them here on this page. Stay tuned. 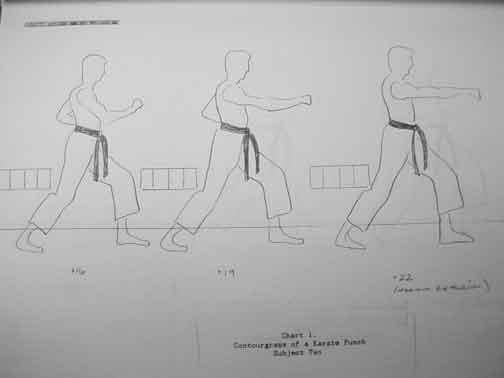 See Paul Sensei in a Karate Punch Analysis study - Scroll down toward the end of this page. Musubi dachi. 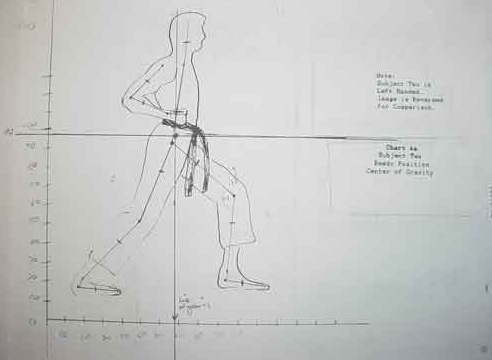 Open foot stance. Stand straight heels together, toes facing outward. Sansen dachi. Fighting stance. (sen means "fighting") Feet apart, toes facing inward. Heikou dachi. 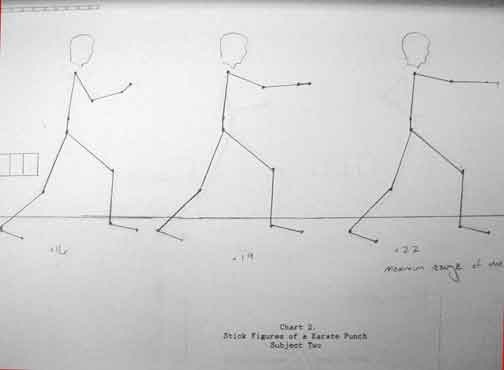 Parallel foot stance. Stand straight feet apart, toes facing forward. Kiba dachi. Horse stance. Feet wide and pointed forward. Shiko dachi. Sumo stance. Feet double shoulder width, feet pointed out. Like horse stance with feet out. 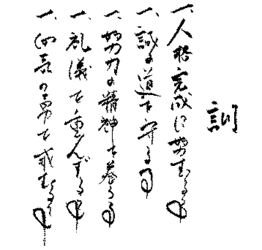 Tsuru ashi dachi. Crane stance. One leg, other foot on outside knee. 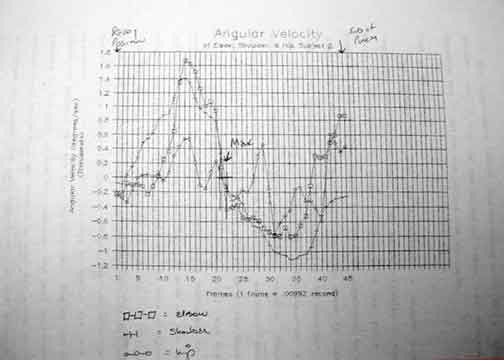 In the mid 1980s, I did many studies investigating which differences in human movement determined injury potential and athletic performance. 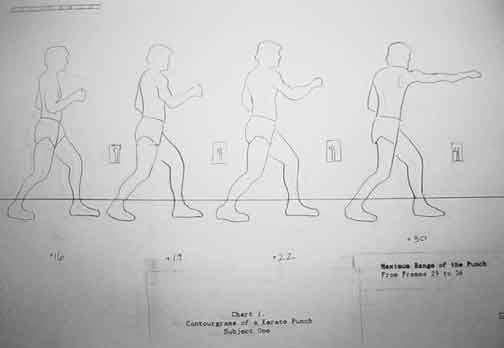 In another kind of study, I wanted to know what made the difference between the punch of a black belt martial artist, and the same punch by an athletic person without training. 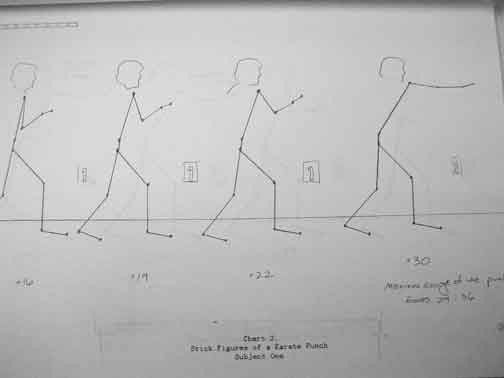 In present day, a computer directly picks up the locations of the person's joints at each point in time, generating a three dimensional computer image of the person as they move in real time. Software automatically calculates, draws, and records the image. Back when I did these studies, we didn't have any of that. I did it all manually. I filmed two subjects using 16mm high speed filming. 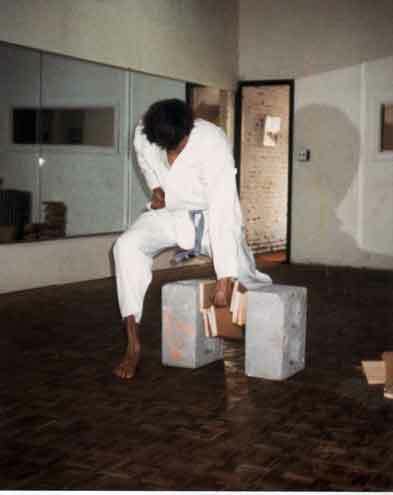 An athletic man who had never done martial arts was subject #1. 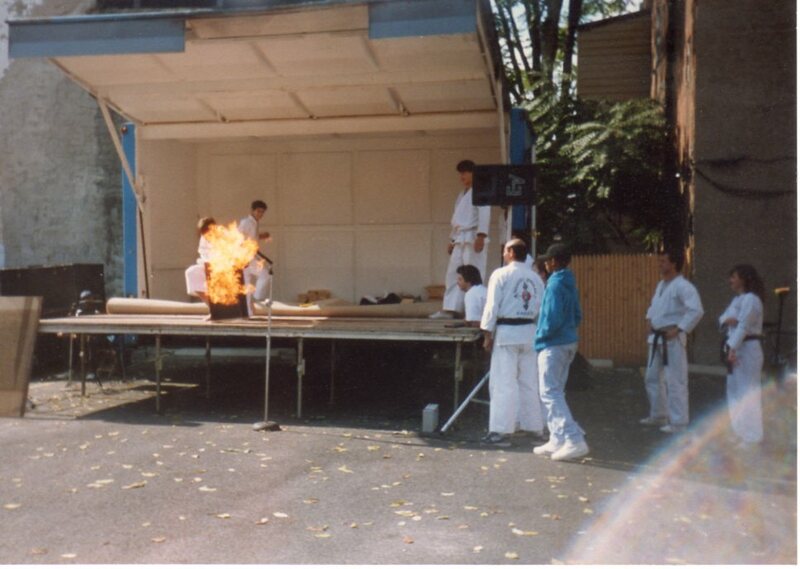 My husband Paul, who had earned his black belt a few years before that, volunteered as subject #2. Paul is left handed so I had to reverse the images to make exact comparisons. 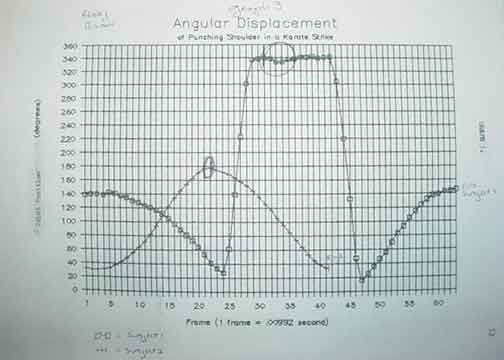 Below are some center of gravity calculations and comparisons. As you can see, there was a lot of hand-calculation and charting back then. Then I could use an advanced machine called a typewriter so that I didn't have to hand write the entire study paper. Not long after, with improvements in automating this process, action video games were first flourishing. I was invited to a computer-generated imagery (CGI) development studio to be their "movement representation figure." They put the dots on my joint centers and filmed me using high-speed 3D computer graphics modeling as I did martial arts and tumbling moves. Not just one punch, painstakingly done, but jumping, spinning, flying all over the studio, and up and down walls. The software automatically generated a mathematical, "wireframe" 2-D representation of my three-dimensional form. From it they animated a wild female warrior action figure for their fighting/mission genre arcade and video gameplay. They also used skeletal animation for when I would morph (on-screen) into various animal forms. I never got royalties but it was fun. This is a big fun topic. 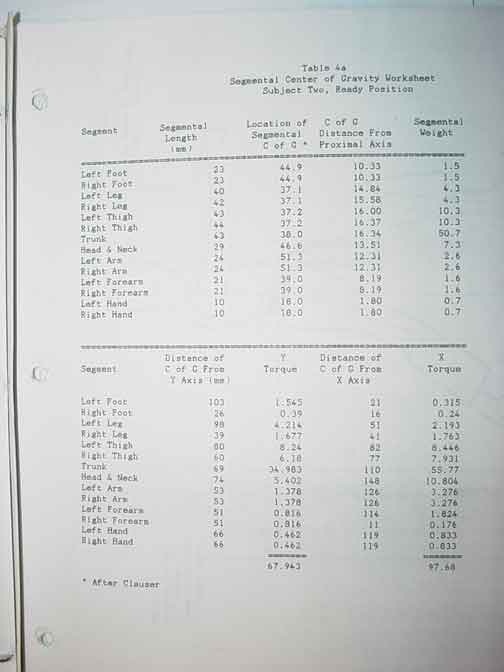 I can post more about motion capture analysis of various sports if anyone is interested. Wealth of training for body and mind. Available at discount to students in class. Print, eBook, and Kindle. The Ab Revolution No More Crunches No More Back Pain new FOURTH edition. Revolutionary core training method - No crunches, no flexion which compresses vertebral discs. Combines sports medicine rehab with fun and functional exercise to workout at the same time you retrain your abs and back for healthy movement during all your activities, and learn neutral spine. Used by military, law enforcement, and the nation's top spine docs. Print, eBook, and Kindle. New Revised THIRD edition. Thirty-one chapters on health, nutrition, exercise, green fitness, preventive medicine, pain prevention, injury repair, your whole life made better. Print and eBook. Self Defense. Paul Sensei also teaches self defense. Click to see the Self Defense syllabus. Home Repair and Home Repair GREEN. Not only is Paul an experienced and gentle martial arts teacher, he is a licensed general contractor, and member of NARI - National Association of Remodeling Industry. Learn in your home with your personal home repair coach. Take his fun, hands-on Home Repair Class. Click here for class schedules and here for Home Repair class syllabus. Private home repair coaching also available. e-mail Paul. See all classes with Paul Plevakas and Dr. Jolie Bookspan. Get Martial Arts Equipment, Books, Movies, Instant Downloads, Fun Stuff - Click through the above links and get anything you like. Amazon.com will send some pennies for each purchase to support this free kickboxing information page. Use it each time you shop, or use my BOOKS page. Thank you!